If You See Michelle, Just Tell Her You Heard We Had a Terrible Time. So we met at Lou Malnati’s, home of the most awesome Chicago Deep Dish Pizza in the world. Lunch had a few minor challenges. Melissa is on a gluten-free diet, and Weaselmomma is in the midst of Lent, during which she can’t eat meat on Fridays (hence no wings!) AND for which she gave up the love of her life, Mr. Weasel beer. At Lou’s, Melissa was good with salad, and Weaselmomma and I ordered a cheese pizza. There are only a couple of things I can really mention about lunch without breaking our pact. First of all, Weaselmomma’s camera battery died almost immediately. I just got to thinking how suspicious this is, because this is the THIRD outing we’ve had during which she’s had camera issues. At our first trip to Woodmans, camera trouble. 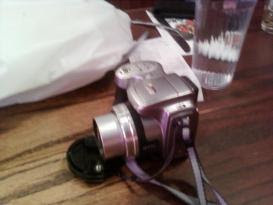 At our wings lunch, camera trouble. Today, camera trouble. Hmmm. Weaselmomma, WTH??? I can also tell you that Weaselmomma did not have beer. 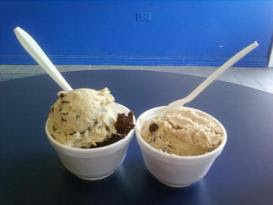 We went to the cookie dough place in town (YUM), and continued chatting there. But I can’t tell you what we talked about. It *certainly* wasn’t you, in case you were wondering. Here are my and Weaselmomma’s cookie dough treats. Melissa’s? Gluten-free diet, remember? She took some home to her hubby, though. So it was a great time, much of which I cannot talk about. But we’re going to do it again in April, and I might try to initiate a conversation that we can all agree is bloggable. I’ll keep you posted! *Please note that although I am a practicing Jew, the Santa/fat reference was what came to my mind rather than, say…ANYTHING ELSE??? Bizarre. Are you making fun of the Photo-Impaired? I’m going to report this to the National Association of Photo Impaired People! That’s was a great time and a lot of fun! I can’t wait until April. Thanks for lunch! It was fun…I have to say I nearly ate the cookie dough. For some reason that was irresistable to me…I think we have a few new converts in our house now…I see multiple cookie dough trips in our future! Did I mention that Friday I was at the preschool without a backpack or lunch and took longer than I thought so at 12:10 had to race home with the wee ones to feed Mister Man lunch before his bus came at 12:30 (uhhh it’s 20-25 minutes door to door) — with him eating 35 second microwaved taquitos sitting in front of the door waiting for the bus that came… at 12:53? And that my friends’ kids were SICK when they came? And that Little Miss had a 103.4 fever this afternoon? And that I FORGOT TO EAT LUNCH yesterday until about 3? And have I mentioned that I really need to quit my job? I gave up pizza for Lent. Looks fun. Can’t say if it SOUNDS fun as you didn’t really give any CLUES on what you TALKED about! Hahah. When in April, if I might score an invite once again? OH, I have your envelope here and can either mail it or deliver it to you at some undisdisclosed location! If you know what I mean! 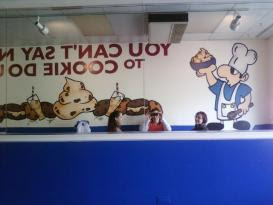 Next time I am in town we ARE going to the cookie dough place! If the tests I am having done for the GI thing result in my being fixed we will also have to get pizza, though I like thin crust and am not a fan of the deep dish. I miss pizza!